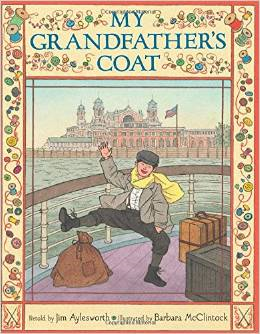 Written in the tradition of a folktale this story tells of a Chinese Grandfather who is well known for his marvelous noodles. 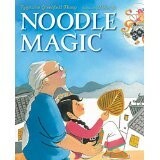 When his granddaughter asks for magic to help her make some noodles, he assures her that she has all the magic she needs already. By the time her story is complete it will be proven that all the magic she needs is right inside of her. It is a positive message for every child to hear. As it becomes time for Mei to try making her own noodles, the birthday of the Emperor draws near. What a great opportunity to make something special. The emperor will need a perfect, magical long-life strand for his birthday celebration. Grandfather and Mei slap and knead the bread. Then it becomes time to stretch and pull the noodles long and thin. Readers will enjoy the karate and kung fu language employed as well as the delightful illustrations of the pulling out process. The noodles seem endlessly long on some pages while on others they are rolled up as nicely as a neat ball of yarn. Bright colors and swirling paint adds to the attractiveness and playfulness of the book. By the time readers finish this story, they will be anxious to make, or, at least, eat a nice big pile of noodles. Near the end of the story when all the noodles are raining down from the sky, young children will delight in being able to find their own favorite type of pasta in the picture as well as the outline of some basic farmyard animals made from noodles. A fun follow up activity for this book would be to have some already boiled spaghetti noodles ready for children to use to make designs or letters with on a piece of construction paper. This book can be used in fulfilling make core curriculum standards for literacy, geography, cultures and nutrition.